Quesnoy is a town in the departement Nord, 15 kilometres north of Lille. Leaving the church in Quesnoy, heading north, turn right at the first set of traffic lights. 200 metres after passing the Marie, on the left hand side, turn right onto the D36. Quesnoy sur Deule Communal Cemetery will be found on the right hand side. 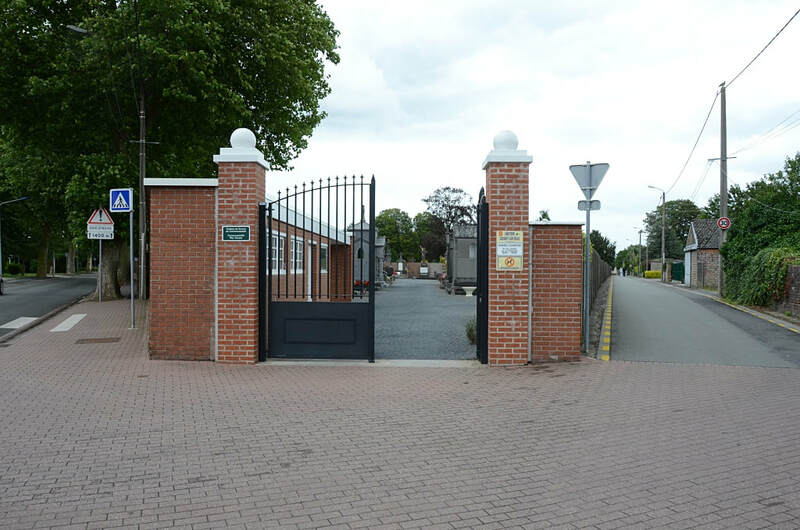 The Commonwealth War Graves plot is situated in the centre of the cemetery. 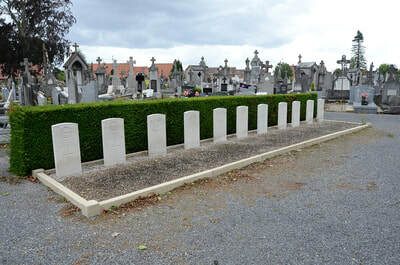 Quesnoy-sur-Deûle remained in German hands for most of the First World War and the Communal Cemetery was used by German troops, and extended by them to the east. 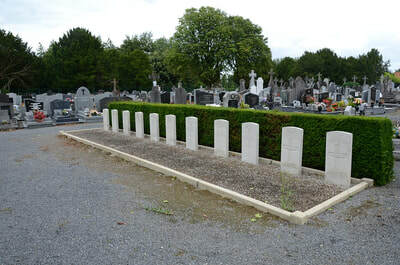 After the Armistice the German graves in the Communal Cemetery were removed to the Extension, 41 Commonwealth graves were removed from the Extension to Cabaret Rouge British Cemetery, Souchez, and the Commonwealth graves in the Communal Cemetery were regrouped. 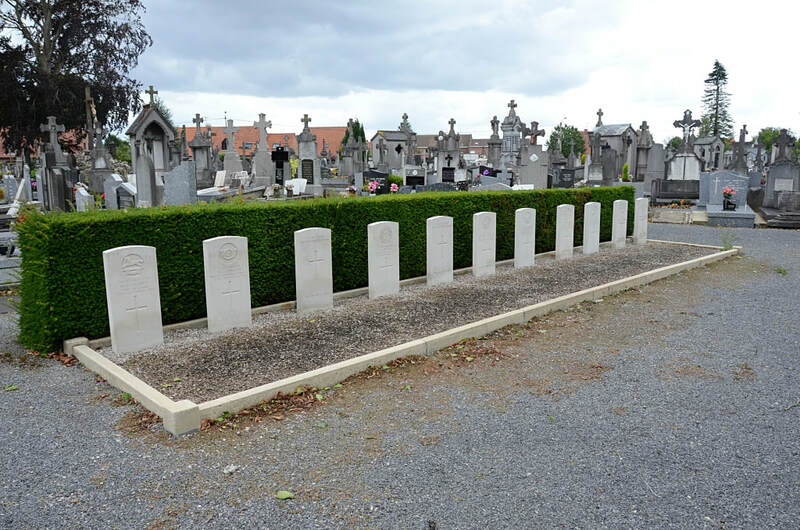 Quesnoy-sur-Deûle Communal Cemetery contains nine Commonwealth burials of the First World War, two of which are unidentified. There are also two Second World War burials. 7337 Private A. Adams, 1st Bn. Hampshire Regiment, died 1st November 1914. Captain William Marshall Burt-Marshall, 2nd Bn. Argyll and Sutherland Highlanders, died 17th November 1914. Son of Catherine Burt-Marshall, of 34, Hans Place, Chelsea, London, and the late James Burt-Marshall, of Luncarty, Perthshire. 5756 Private R. Hayball, 1st Bn. Somerset Light Infantry, died 25th December 1914. 6964 Private T. H. Keetley, 2nd Bn. King's Own Yorkshire Light Infantry, died 26th November 1914. 4797 Lance Corporal F. C. Scott, 3rd (King's Own) Hussars, died 25th October 1914. 7888 Private H. G. Smith, 2nd Bn. King's Own Yorkshire Light Infantry, died 23rd November 1914. 978 Lance Corporal John Campbell Stobo, 2nd Bn. Seaforth Highlanders, died 29th October 1914, aged 20. Son of Alexander and Agnes Forrester Stobo, of 7, Fairley St., Dennistoun, Glasgow. 1524795 Gunner Dennis Dunn, 222 Battery, 56 Anti-Tank Regiment, 4th Bn. The King's Own Royal Regiment, died 28th May 1940, aged 22. Son of Harriet Dunn. 1464107 Gunner Edward Wilcox, 222 Battery, 56 Anti-Tank Regiment, 4th Bn. 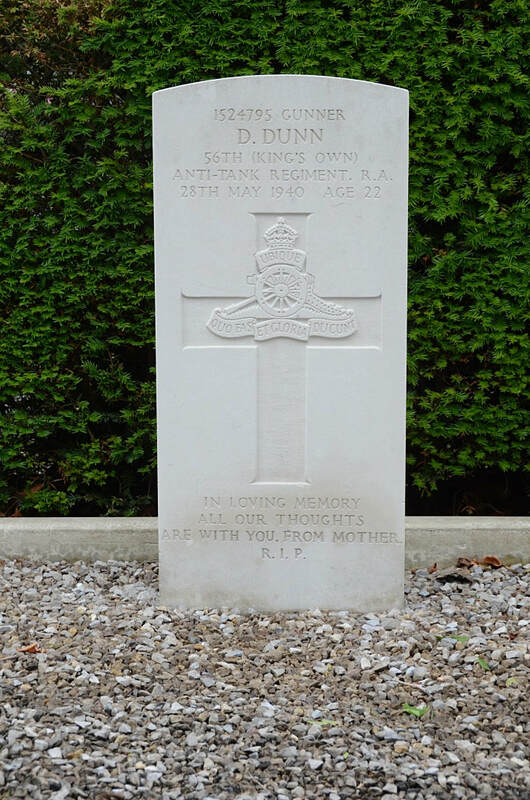 The King's Own Royal Regiment, died 28th May 1940, aged 20. Son of John Robert and Phyllis Mary Wilcox, of Barrow in Furness, Lancashire.